We have noticed that many students apply to prominent public universities and then, almost as an afterthought, begin to wonder if the honors program at University A makes that school a better choice than regular admission to the higher-ranked University B. A far better way to look at honors is to evaluate programs in some depth at the earliest stages of the college application process. Otherwise, students realize too late that the honors application or scholarship deadlines have already passed, or find themselves searching for anecdotal evidence with little time to spare. 1. Match basic admission requirements with your test scores, GPA, and essays. 2. Request actual average admission statistics. These may vary greatly from basic (minimum) requirements. In general, honors students will have average test scores 6-10% higher than the 25th percentile of accepted students for the university as a whole. The 25th percentile scores are available from U.S. News and other sources. If there is a wide gap between the basic and average stats, and your stats are much closer to the basic stats, then you can probably find a better option. That said, if the admissions requirements are more holistic and less stats-driven, you may be fine. 3. Determine the size of the honors program (mean size in major public universities is ~1,700, but programs may be as small as 140 or as large as 6,000). 4. Ask the fish-to-pond question: Are honors students big fish in a small pond or is the pond full of sizable fish? The more selective the university as a whole, the bigger all the fish. Some parents and prospective students might prefer an honors program that stands apart on campus, while others might like a program that is more expansive. Perhaps if you are not sold on the overall quality of the university, you might choose the former; if you think the university as a whole has a strong student body or you simply prefer a non-elitist atmosphere, then you might like the latter. 5. Assess the quality of the city, surrounding area, and climate. 6. Determine the curriculum requirements as a percentage of graduation requirements. Generally, the number of honors hours should be at least 25% of the total required for graduation. 7. Determine the number of honors sections per semester/quarter. 8. Evaluate the reputation of university in preferred or likely areas of study. 9. Ask whether there are special research opportunities for undergrads and if an honors thesis is required. 10. Ask about staff size, the number of advisers, and availability to students, as well as special freshmen orientation programs. 1. Ask about the number of honors sections, by discipline, per semester or quarter and try to verify; determine the average enrollment in honors seminars and sections. The average class size can vary greatly among honors programs, from fewer than 10 students per class to more than 35. Most seminars and all-honors sections should have around 25 students or fewer, although in almost every case you will find that there are a few large classes, notably in first-year sciences and economics. Some honors programs have few or no honors courses in certain disciplines. 2. Ask about the types of honors sections: all-honors seminars; all-honors sections offered by honors or a department; “mixed” sections of honors and non-honors students; and the percentage of honors contract/option/conversion courses per average student at time of graduation. Mixed sections may be small or, more often, large sections that can have more than 100 total students in 3-4 credit hour courses. Of these students, maybe 10-20 could be honors students, who then meet for one hour a week (rarely, two hours a week) in separate “discussion” or “recitation” sections. These sections can be led by tenured professors but are typically led by adjunct faculty or graduate students. Ask how many sections are mixed, and of these, ask how many of the main section classes are large. Contract courses are regular–and often larger–sections with both honors and non-honors students, mostly the latter, in which honors students do extra work or have their own discussion sections. While most programs have some contract courses, they are generally more prevalent in large honors colleges and programs. There are advantages and disadvantages associated with contract courses. They can speed graduation, offer more flexibility, expand the influence of honors in the university as a whole, and foster contacts with mentoring faculty. But their quality and size may vary greatly. 3. Ask about tuition discounts, scholarships, continuing financial aid, including special recruitment of national merit scholars. 4. Determine if there is priority registration for honors students and, if so, type of priority registration. 5. Research the types of special honors housing for freshmen and upperclassmen, if any, including basic floor plans, on-site laundry, suite or corridor-style rooms, air-conditioning, location of nearest dining hall, proximity of major classroom buildings (especially in preferred disciplines), and availability of shuttles and other transportation on campus. If there is no special honors housing, it is often a sign that the honors program does not want to foster the big fish in a small pond atmosphere. The absence of priority registration may be an additional sign. 6. Research the study-abroad opportunities; some universities have a separate division for study-abroad programs. 7. Ask about the presence and involvement of advisers for prestigious scholarships, such as Goldwater, Rhodes, Marshall, Truman, etc., and program success in achieving these awards. 9. Now, try to assess the quality of the honors program versus quality of university as a whole. 10. VISIT the college if you have not done so and try to question current honors students. Some of the information mentioned above can only come from a personal visit or be learned after a student has been accepted. Editor’s Note: The following article by Nancy M. West, Director, University of Missouri Honors College, originally appeared in the January 27, 2014, edition of the Chronicle of Higher Education. At a baseball game two summers ago, as other parents cheered on their kids, I argued about the value of an honors college with the father of my son’s teammate, whom I’ll call Tyler. Then he looked me straight in the eye and asked, “What’s the point of an honors college, anyway?” It was hot, and I wanted to smack him. So I gave him a snooty answer about how I thought “any parent would want his child to challenge himself.” Needless to say, he didn’t respond well. That exchange turned out to be the first of many conversations I’ve had about the value of an honors college. Like Tyler’s dad, though more politely, prospective students express concern that the challenge of an honors curriculum will jeopardize their GPAs, and therefore their chances of finding a job or getting into graduate school. So do their parents. Some people on campus bristle at the “elitism” of honors colleges, uncomfortable with the notion of singling out students for special attention and benefits. Both of these viewpoints are understandable. More distressing has been my realization that the honors college often needs to be defended to administrators, from department chairs upward. Honors education has never been a cost-effective enterprise, given its demands for quality instruction, small classes, enhanced opportunities, and personalized service to students. As more and more colleges gravitate toward larger classes and online delivery, honors now seems like a luxury they can no longer afford. We need then to think about honors colleges in a way that deals with current anxieties and economic pressures. And we need to state their value so that it can resonate with many people, even Tyler’s dad. So what is the point of an honors college? There are two ways to answer that question. The first is in terms of students. Most high-ability students need individual attention. Honors colleges provide that. More important, they promote the value of striving for the best one can do. 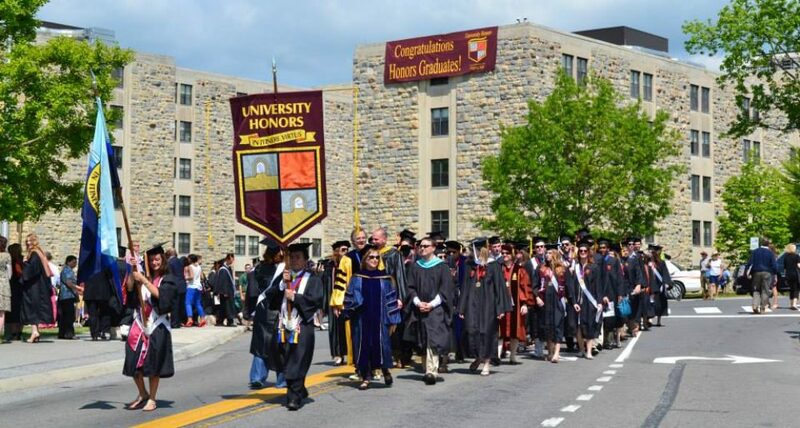 In an academic culture tainted by grade inflation, honors colleges celebrate true accomplishment, instilling in students the pride that comes with being thoroughly in earnest about their education. Honors is thus the “natural home of pure meritocracy,” as my colleague David Setzer argues. Universities need such a home more than ever. While colleges become more like companies, and “excellence” increasingly refers to financial success, surely we can justify the value of an honors college by guaranteeing that it remains one space on the campus where deep thought flourishes, and where “excellence” still possesses meaning. The other way to answer the question of an honors college’s value is in terms of its benefit to a university. For one, honors colleges enhance the prestige of their universities by enrolling high-achieving students who provide a leavening influence on the campus and then go on to achieve great things. They also have the potential to serve as a “third place” for their universities. In 1989, the sociologist Ray Oldenburg coined the term “third place” to refer to environments, separate from work and home, which people visit frequently and voluntarily. Examples include coffeehouses, cafes, salons, and the Internet. Although they vary wildly in look and feel, third places share certain fundamental traits. They act as social levelers, discounting class status as a marker of social significance. Their mood is playful; their atmosphere is warm and friendly. They promote group creativity and lively conversation. Most important, they serve as anchors of a community, fostering broad and less scripted interactions than those we have at home or our regular workplaces. “These shared areas have played an outsized role in the history of new ideas,” observes Oldenburg. And yet compared with other countries, America does not place much importance on third places. And what’s true of our country is also true of our universities. Faculty and staff rarely venture beyond the buildings that house their departments. University officials sequester themselves in spacious offices located within buildings populated exclusively by administrative offices. And students—too many of them these days—go from their classrooms to their part-time jobs to their apartments. Universities need third places in order for new kinds of research and thinking to propagate. Honors colleges, meanwhile, need a new identity in order to successfully assert their value in the future. Thinking about honors colleges as third places gives us a new and non-elitist way of asserting their value to a university. It reinforces how they can serve as spaces of creativity; conversation; intellectualism; collegiality. It also reinforces their potential as homes of interdisciplinarity. Like all third places, honors colleges are neutral ground, separate from departments and yet in the business of serving them all; as such, they provide an ideal space for the kind of “in between” collaboration required by interdisciplinary work. Honors colleges are where team-teaching—that activity we all say we should do more of but can’t because of departmental restrictions—really can happen. This spring, thanks to the cooperation of the art history and English departments, I’m team-teaching an honors course called “Thinking About Color” with two other professors. The course is wildly interdisciplinary, focusing on subjects like Technicolor and the history of mauve. Our planning meetings for the course have been electrifying, intellectually and pedagogically. And in each meeting, ideas for collaborative research bubble up. I can’t remember ever feeling this creative, or collegial, about my teaching. The answers I’ve articulated here all arrive at the same conclusion, which is that the “point of an honors college” is its idealism. Honors represents higher education at its best and most aspirational. If I could replay that dreadful conversation with Tyler’s dad from two years ago, that is what I’d tell him. I’d also point out that my son, Silas, hit a double that day. The leadership of the National Collegiate Honors Council (NCHC) has completed a survey of more than 400 honors colleges and programs, many of them at smaller institutions. The average total enrollment at the colleges surveyed is 6,484. The average size of the 50 larger state universities we surveyed was much larger, just under 25,000 students. NCHC President Rick Scott, Dean of the Schedler Honors College at the University of Central Arkansas, released the report. As we found earlier in the post Honors Colleges vs. Honors Programs, honors colleges tend to have a greater “value added” impact on large universities that are not as selective as some of their counterparts. For example, UVA, UNC Chapel Hill, Michigan, and UT Austin do not have honors colleges, and their strong “value” is often validated by external rankings and other measures. All these universities have strong honors programs, but the extent to which they add value to the universities as a whole is less than the impact of honors colleges on less selective schools. The Barrett Honors College at Arizona State, for example, is a powerful value added feature for the university as a whole. Most of the two-year and four-year colleges in the NCHC survey are not highly selective. Therefore, it is not surprising to us that the NCHC survey did in fact show a significant difference in the size and positive impact of honors colleges at these school versus the impact of honors programs. What this means for prospective students who are looking at honors options offered by smaller or less selective colleges is that, in general, the schools with honors colleges will have stronger honors components, especially in several extremely important categories. Size–In smaller institutions, the size of the honors component can be especially important. The survey showed that the average size of responding honors colleges was 814 students, but only 292 students for honors programs. By contrast, in our evaluation of fifty large university honors colleges and programs, there was only a very slight difference in the relative size. Staff–The survey found that honors colleges had an average of 4.9 full-time employees, while honors programs had only 1.2 FTEs. Advising–In the very important area, 77 percent of honors colleges had their own advisers, and only 44 percent of honors programs did. Prestigious Scholarships–Guidance for outstanding students applying for Rhodes, Truman, Goldwater and other awards was available in 45 percent of the honors colleges but in only 16 percent of honors programs. Honors Housing–83 percent of honors colleges offered honors residence choices, but only 46 percent of honors programs did so. Living/Learning Options–Again, 73 percent of honors colleges had living/learning communities, but only 33 percent of honors programs did. Curriculum–Here, 73 percent of honors colleges also offered departmental honors, while 59 percent of honors programs did so. Internships–Honors colleges offered much stronger opportunities for internships, 44 percent versus only 22 percent for honors programs. The Jefferson Scholars program at UVA was not rated as an honors program because it is primarily a generous financial support program coupled with enrichment activities for only about 30 students each year. The good news is that you can be both an Echols Scholar, which allows you almost total freedom in course selection along with housing and priority registration benefits, and a Jefferson Scholar, fortunate enough to receive the outstanding financial benefits and enrichment features of that program. Admission to each program is, however, separate, so some students invited to be Echols Scholars do not receive Jefferson Scholarships, and some Jefferson Scholars are not in the Echols Program. While the state of Florida plans to charge less tuition for STEM majors, the Lyman Briggs College at MSU has been attracting students in these high-demand fields for more than 40 years without penalizing students in the humanities and social sciences. Indeed, LBC is dedicated to bridging the gap between the hard sciences and the liberal arts. The LBC began in 1967 in response to C.P. Snow’s famous concept that “Two Cultures” had grown up in academe, with the unfortunate results that education in what we now call the STEM subjects was often separated from education in the other “culture” of the humanities and social sciences. The LBC welcomes about 625 freshmen each year, many of the honors students at MSU. The core curriculum includes calculus, general chemistry, physics, biology, and a three-course sequence in the history, philosophy, and sociology of science (HPS courses). Students take upper-division STEM courses in as many as 17 different majors and may choose to complete a capstone project that encompasses both major work and HPS classes. Students have the benefit of much smaller classes, inquiry-based and research-oriented instruction, and frequent association with faculty and other STEM students who attend classes at LBC. LBC students are eligible to become Undergraduate Learning Assistants as early as their sophomore year, giving them the opportunity to assist faculty with teaching and research. In addition, through MSU’s excellent honors college, there are 94 Professional Assistants at LBC who work on research-intensive projects. The results: the freshman retention rate for LBC students is 95.5 percent. Some 82-86 percent graduate in six years, versus an MSU average of 74-76 percent–an exceptionally strong figure given the rigor of STEM studies. Nationally only about 50 percent of incoming STEM majors actually graduate with STEM degrees. For LBC students, the percentage is 70 percent, including a strong rate for female students and students of color. Finally, the number of LBC grads pursuing post-graduate work is 80 percent, an extremely high number.